Als songwriter, zanger, producer en bandleider werkte Walt Wilkins tien jaar in Nashville. Zijn songs werden opgenomen door artiesten als Ricky Skaggs, Kenny Rogers en Pat Green. Zelf wordt hij wel vergeleken met andere grote troubadours als Guy Clark en Townes van Zandt. In Nederland verwierf hij bekendheid als producer van de eerste twee platen van de hier erg populaire Sam Baker, met wie hij ook diverse keren in Nederland tourde. Na tien jaar Nashville-songwriter te zijn geweest, keerde Wilkins terug naar zijn geboortestaat Texas. Daar creëerde hij met zijn band The Mystiqueros een Texas Hill Country supergroep, die een podium biedt aan een prachtige verzameling getalenteerde muzikanten en songwriters. De muziek van The Mystiqueros is schatplichtig aan de seventies countryrock uit Texas en de West Coast (onder meer prachtige meerstemmige vocalen), maar ook geïnspireerd op de soul, en kent daarnaast invloeden van Tex-Mex en de Mississippi Delta blues. Kortom, een bonte verzameling muzikale geesten die oorspronkelijke liedjes vertolken (naast een enkele goedgekozen cover) op een aanstekelijke en zeer geïnspireerde manier. Het in mei verschenen Mystiquero-album 'Wildcat Pie & The Great Walapateya' is als voorproefje alvast fantastisch, met maar liefst 17 heerlijke nummers. Country- en folkrock van grote klasse, met hier en daar een verstilde parel ertussendoor. Walt Wilkins & The Mystiqueros is an eclectic troupe of super talented singer-songwriters that perform both together and as solo acts. Throughout the years there have been numerous albums released by Walt Wilkins, and his core Mystiqueros Bill Small and Ray Rodriguez, along with the rotation of Jimmy Davis, Marcus Eldridge, Brian Langlinais and of course the lovely Tina Wilkins have all released or contributed to numerous solo and collaborative efforts. 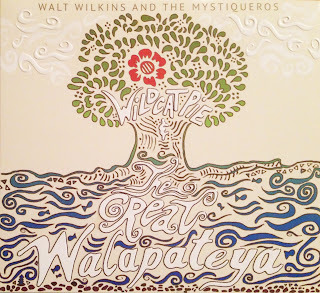 This latest album entitled simply "Wildcatpie & The Great Walapateya" is a product of the free spirits that make up The Mystiqueros as well as numerous contributing songwriters that work with and/or have inspired them. It's a heaping scoop of Mystiquero, with a dash of external inspiration and influence. Walt Wilkins is the soulful core of this group. He is the life breath of everything Mystiquero, and without his presence this combination of assorted musicians wouldn't be near what it is today. At the same time though Walt is not the lone "front man" of the group, he shares this duty very evenly across his capable team. Walt co-wrote "King for a Day", "Love & A Good Buzz" and "Salinda" on this album, but many of the other songs feel like they've been heavily influence by Walt's style. As for vocals, Walt had lead or shared lead vocals on "It's Only Rain", "King for a Day", "Love & A Good Buzz", "Salinda", "Give Me Strength" and "Dancing In The Moonlight". Bill Small brings great depth and balance to the band. His vocals in "This Old House" are so full of emotion and grit you can feel the influences his own life had on writing this song. Although he wrote it about 10 years ago during a brief stay in Nashville, it remained unreleased until he recorded it for his album "Next Time" which was released in May of 2010. Other great songs by Small include "Somebody" and "She Must Be Out Of Her Mind", he also co-wrote "King for a Day" with fellow Mystiqueros. Brian Langlinais is in his own words a "roadhouse singer". The majority of his musical influence came from Texas and Gulf Coast dance halls, and he brings a different brand of soul to the group. I hear a lot of what I remember hearing from the soft rock artists of the 70's and 80's such as Van Morrison or even Terry Kath from the early days of Chicago. Brian has lead vocals on "Hold Me Tight" and "From Here to There" both of which he co-wrote. Jimmy Davis has 4 songs on this album including track one "It's Only Rain" that is currently being played by select radio stations. Jimmy released this on his 2006 album "Campfire Songs" and it also appeared on a live Mystiquero album from the 2011 Kerrville Wine & Music Festival. Davis' other tracks "If I Had A Little Truck", "Down Where The River Flows" and "Believe" show both his talent and diversity, he is truly an interesting piece of the Wildcatpie. Marcus Eldridge puts some of the rock into the easy roll of the band with his hot guitar licks and smooth vocals. Marcus wrote and sang lead vocals on "Under the Midnight Sky" and co-wrote "King for a Day". Marcus is currently playing in The Drywater Band doing weddings and large events, although he is also doing a great deal of solo touring and sitting in with other bands. Marcus is currently working on a new solo album. Ray Rodriguez co-wrote "King for a Day" with Wilkins, Small and Eldridge. Along with Small, he is probably one of the most consistent members present with the band at almost any given time and he lays down the familiar beat that drives the Mystiqueros through each set. Other contributing songwriters consist of Glenn Simmons, Liz Rose, Naoise Sheridan, Randy Sitzler and Drew Nelson. This album also includes praiseworthy covers of tunes from Eric Clapton, Harlan Howard/Tompall Glaser and Doug Sahm. Also, besides the Mystiquero regulars there is a whole host of contributing studio instrumental and vocal musicians such as Kelley Mickwee, Tommy Alverson, Corby Schaub, Ron Flynt, Kim Deschamps, Bart Dewin, Pat Manske, Patterson Barett, Mike Horn and Mike Daly. Now as for finally getting down to the meat of the album, I've been listening to this for several weeks now and I have yet to tire of a single track to the point of skipping it each time it comes up. I do however have favorites! Jimmy Davis' song "It's Only Rain", "King for a Day" written by a quartet of 'queros, "Love & A Good Buzz" by Walt Wilkins and Liz Rose, "This Old House" by Bill Small and the cover of "Dancing in the Moonlight" are my current top 5, although the remaining 12 tracks aren't far behind and that was very tough to narrow it down to 5. In fact, if you were to ask me 2 weeks from now you might get a different answer! Each time I listened to the album, one particular question kept plaguing me. I couldn't figure out who sang lead vocals on "Beautiful Texas Sunshine". I couldn't nail down in my head who I thought it was, but Bill Small was kind enough to let me know it was actually Tommy Alverson. This song was written by the late Doug Sahm of the Texas Tornados and is actually one of Alverson's favorite songwriters, so this was a perfect fit! All the Mystiquero penned tunes are everything you've come to expect from this group, as they have continued to grow musically and as songwriters over the years. The tribute/cover side of this album is actually really cool too, and I've found myself spinning "Dancing in the Moonlight" quite often, and I had to go back and listen to earlier recordings of it. Sherman Kelly wrote the song in 1968 and recorded it with Boffalongo. King Harvest released it in 1972 as a single that got to number 13 on the Billboard Hot 100, then in 1973 as the title track of their first studio album to release as a band before disbanding less than a year later. It was covered many other times, but most prevalent in my memory was Van Morrison. However, after much research I found that he never actually recorded the song. That aside, this is by far in my opinion the best this song has ever sounded! I believe the only way to get this album currently is to go see the band live and buy a copy. They still play most Wednesday nights at The Saxon Pub on South Lamar in Austin, and tour actively as a band and separately, so find Walt, Bill, Jimmy or Brian at a gig and pick up a copy!